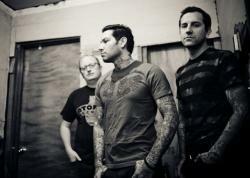 MxPx is an American punk rock band from Bremerton, Washington founded in 1992 as Magnified Plaid. The band has skate punk and pop punk leanings, with connections to the pop punk scene. Current members include Mike Herrera on lead vocals and bass, Tom Wisniewski on guitar and backing vocals, and Yuri Ruley on drums. The band's discography includes nine studio albums, four EPs, four compilation albums, a live album, a VHS tape, a DVD and 20 singles. A number of their releases have charted on Billboard, including the Billboard 200 and No. 1 on Billboard Christian Albums.